Lionsgate Films releases Nightlight at AMC Empire on March 27th, 2015. Bryan Woods: Scary movies in general allow regular people to express some of their fears just based on something that's going on in their life. Because you have to put on a tough exterior in your daily life, scary movies give people an opportunity to go through a cathartic experience usually. I know that's certain what Scott and I are drawn to. Scott Beck: One of the things that we really enjoy is the visual reaction from the audience. Whenever there's a new horror film coming out, Bryan and I want to be there opening weekend just to really hear the screams and the laughter from the audience. Regarding Nightlight, that's one of the things that we were aspiring to by blending laughter and horror. Bryan Woods: We've always loved Alfred Hitchcock and greatly admire the way that he was able to play the audience in a way like this is when you're going to scream and laugh. It's always a thrill for an audience member. NYC MOVIE GURU: Roger Ebert once stated that horror films don't need a big star because the horror itself is the star. Do you agree or disagree? Bryan Woods: Yes, absolutely. In fact, we quote that line from Ebert religiously. He's one of our heroes. We felt like we could cast the best people for the roles and cast didn't need to worry about name-value necessarily because the genre itself is, absolutely, the star. Scott Beck: The unique thing that we were trying to do in Nightlight is to tell a story from a very unique point-of-view. That, somehow, became the window into the film for the audience, and also an immersive device that hopefully puts the audience into the horror as closely as possible. NYC MOVIE GURU: How challenging was it to keep the running time under 90 minutes? Scott Beck: It certainly is a challenge especially from our point of view. For a lot of the production of the film, we were shooting the scenes in one take basically. A lot of those one-takes are certainly there, but we have to pick and choose to make sure we're not losing the audiences' patience. In the post-production process, it was definitely a delicate balance---not only during the editing stage, but also in terms of doing the sound design and the mix. Sound for Bryan and I is always paramount from a storytelling experience. In Nightlight, we're playing with a lot of darkness, so we wanted to have that fear of what may be out there that you're not seeing. It conjures up terrifying images in your head which is usually more terrifying than having something jump out at you. NYC MOVIE GURU: Do you think that something would be lost by watching Nightlight on the small screen? Bryan Woods: We really fought hard to make the theatrical experience as strong as possible. The crew who worked with us on the sound design did such an incredible job. The big screen really gives you that full view of the forest. Throughout the film, there are traces of evil that have come in. If you look really, really closely, even as early as 10 minutes into the film, there's all kind of visuals going on in the trees and in the corners of the frame. I don't know if it would be as obvious on the small screen. So, I really do hope that people will catch it in theaters if they have the opportunity. It is a very frightening experience. Scott Beck: Seeing it with a group of people is kind of the fun of it. So at certain moments, maybe earlier in the film, one person in the room would see something that others might not. Bryan Woods: This might be a weird reference point, but one of our favorite filmmakers is Jacques Tati. We always loved his little French movies where you see it on the big screen and there's so much going on, and the fun of it is watching something with your friends. 100 people are watching the movie, but they all kind of are seeing little different things, and then they inspire other audience members to look closer. NYC MOVIE GURU: Would Nightlight work in 3D? Scott Beck: Early on, when we were in pre-production, our financiers asked us that question. At that point, it was so close to production that it wouldn't have been feasible. I do think that there's a version that could work in 3D, but the fact that the film is told from the point of view of a flashlight, it's necessarily a 3-dimensional device in some respects in terms of how the light flashlight works. That's a technical analysis of it which may be beside the point, but I think it certainly could work in 3D because you're working with the depth of things in the forest. We tried to create that on a 2-dimensional plane, obviously, by having the sides of the frame fall into darkness and such. It could be a more immersive experience in 3D, moving forward, if there was a sequel. NYC MOVIE GURU: Were you aiming for an R-rating? How do you feel about its R-rating? Bryan Woods: The film is not an R-rating like in a traditional horror movie. As filmmakers, we think that what's most scary is what you don't see, so a lot of the violence in the film is implied. We didn't base the characters on any specific people that we know, but just in general about people that we're surrounded with. We really wanted to be true to their voices. Those particular characters do use a lot of language, so we wanted to make sure that that was preserved. Rating isn't something that we talked about other than what was appropriate for the language in the film and what was going to be truthful to the characters. NYC MOVIE GURU: What do you think is the root of fears of the dark? Scott Beck: The fear of what's out there was purely for the sake of survival goes back to primitive times. That exists to a certain extent today. When we're kids, we're not told to be afraid of the dark; we just inherit that because it's who we are. Whenever I see a scary movie and go home and have to turn the lights off, it's terrifying because there's something innate in every step that says to me, "Look behind you! There's something coming after you!" 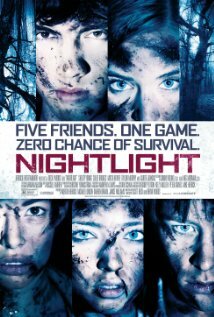 NYC MOVIE GURU: Would knowing as little about Nightlight's plot before watching it help one enjoy the film more? Bryan Woods: I think so. We always love going to new movies without reading as much as possible and then after the movie, reading as much about it as possible. There is a big secret in the film with regards to its point of view, and I think that the less that people know going in, the more enjoyable it will be. NYC MOVIE GURU: How far into the writing process did you know what Nightlight's ending would be? Scott Beck: From the very beginning because we were telling the story from a specific point of view that was trying to differentiate itself from what the horror genre has become. We wanted to make sure that the point of view had a reason and a purpose and that it tied into the characters. Every so often, in a lot of "found footage" movies, the device of filming something is never really substantiated, so for us that was the challenge--to incorporate it all and also to do something different. Bryan Woods: I think about Night of the Living Dead and Invasion of the Body Snatchers---those are the movies that first popped into my head. They are not only extremely scary, well-written and well-made, but they're also about something that's bigger than just monsters, aliens and zombies. Scott Beck: The Shining is a film that has a rich mythology, but also leaves a lot of lasting questions for conversation. At the time, the film didn't necessarily perform well, but we're still talking about it 40 years later. Personally, The Shining is one of my favorites because there are so many things I'm still trying to figure out about it, and I'm constantly engaged by it no matter how many times I watch it. NYC MOVIE GURU: What would make a great double feature with Nightlight? Scott Beck: Enter the Void. It was certainly a touchtone as to how tell a story from a limited point of view while still conveying character and story. It certainly was a challenge that we were trying to tackle. Bryan Woods: That's a good answer, Scott, because Enter the Void is also very experimental, and the filmmakers were trying to do something really interesting on a technical standpoint. We tried to do that as well. It felt very experimental for us. NYC MOVIE GURU: What advice would you give aspiring filmmakers who want to continue co-writing and co-directing films with one another? Scott Beck: Bryan and I knew each other since we were 12-years-old. It's hard to give advice on that, but what our story is all about is that we were friends, first and foremost, and we grew up watching the same movies and having a similar vibe and sensibility of movies that we loved. It's really important to find somebody that shares those same sensibility, but also challenges you, and challenges you to become a better filmmaker. One thing that Bryan and I always do: we try to one-up each other. It's like this friendly back-and-forth and friendly competition which drives us to be more creatively inspired. Bryan Woods: We talk a lot about how films are super-collaborative mediums. We collaborate with our cast and crew, so for us it's just an extension of working as a team, and movies are made by teams.